After making the easy cheese danish, I still had an extra box of puff pastry and some apples to play with. I decided to make another cheese danish and added some sweeted apples to the mix for another variation. Instead of making small danishes, I opted for a large one filled with the same cheese mixture and apples that I sauteed with brown sugar, butter and cinnamon. The result was outstanding and it was a big hit at my husband's office! Toss the remaining apple mixture ingredients except in a large bowl. Place the apple mixture in the saute pan and cook until apples are softened. Remove from heat and allow to cool; set aside. Unfold 1 sheet of puff pastry onto a lightly floured board and roll it slightly with a floured rolling pin until it's a 10 by 10-inch square. Transfer the puff pastry onto the parchment lined baking sheet. Place half of the cheese filling down the middle of the puff pastry square. 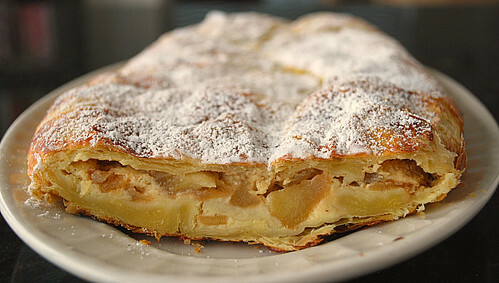 Place the cooled apple mixture over the cheese filling down the middle of the puff pastry square. Brush the border of the pastry with egg wash and fold the sides of the puff pastry square over the filling so the sides overlap. Brush the top of the pastry with egg wash and refrigerate the filled Danish for 15 minutes. Bake the pastry for about 20 minutes, rotating the pan once during baking, until puffed and brown. Serve warm. To garnish, sprinkle with powdered sugar. You have the very best recipe. I could just copy your blog and start cooking. These cheese danishes look great and I plan to make them.